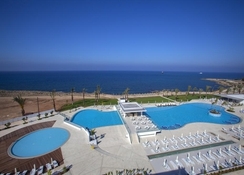 King Evelthon Beach Hotel & Resort is a lovely beachfront hotel offering a comfortable luxury retreat in sunny Paphos. Nestled cosily on the Chlorakas bay, amidst lush and landscaped gardens of 100,000 square meters, this property offers an unforgettable stay to its guests. With its own water park, a kids’ club, spa and a la carte restaurants this luxurious property has great amenities that are truly word-class. Well-furnished guestrooms in opulent décor and with all modern amenities beckon guests to spend their days (and nights) in absolute relaxation with warm, unobtrusive hospitality offered by the hotel staff. 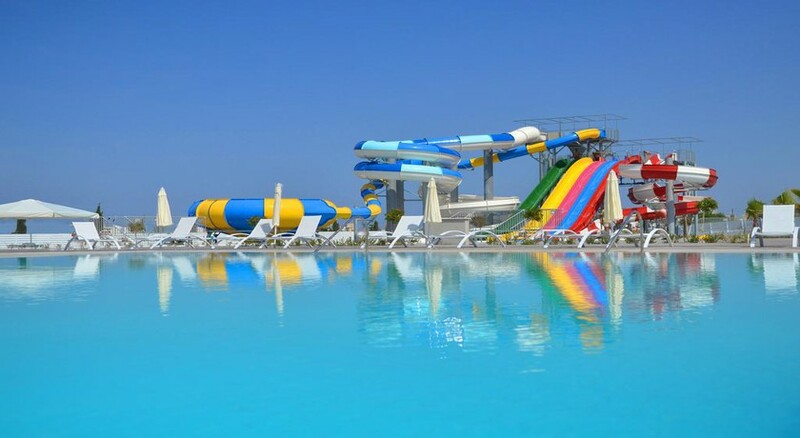 Enjoy your beach holidays at Paphos to the maximum when you check into this facility-packed resort. 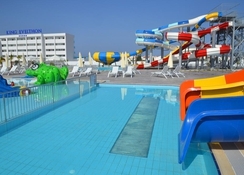 The King Evelthon Beach Hotel & Resort in Paphos Town is located on the Chlorakas bay. Chloraka is known for its tangerine sunsets and balmy weather all year round. The historical site of Tombs of the Kings, a popular tourist attraction, is only 2km. The Agia Kyriaki Chrysopolitissa is 5km from the hotel. The Paphos International Airport is about 20km from the property. 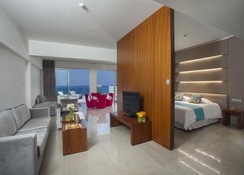 The King Evelthon Beach Hotel & Resort has well-appointed guestrooms with furnished balcony or a patio offering magnificent views of the Mediterranean Sea. 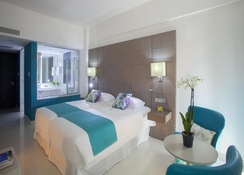 The rooms have parquet floors, flat-screen satellite TVs, a mini fridge and a private bathroom with a hairdryer and free toiletries and come with a seating area. The hotel has two delightful restaurants one indoors and another outdoors with al-fresco seating arrangements. Order from an array of local and international cuisines made by expert chefs from the freshest ingredients. The hotel also has three bars – the Terrace bar, the Wooden Cosy bar and the Pool Snack bar, where guests can relax with their cocktails. A special kids’ menu can be ordered upon request. Me and my girlfriend went in December and it was brilliant value for money and brilliant place altogether! I definitely recommend. Stunning sunsets, flavoursome food and attentive staff! My boyfriend and I are both visually impaired and travelled to Cyprus to stay in this hotel on our own! From the moment we arrived the staff were incredibly attentive and helpful, with nothing being too big and ask! The hotel is tastefully decorated, it’s bright, open, airy and spacious feel added to the luxury factor of staying in a five star hotel! we hadn’t realised that the reason our stay was so cheap was because we arrived just after peak season, however this was not a problem at all as the atmosphere in around the hotel was still very organic and vibrant! The food was lovely but the choice of the same consistent things or different Varieties of food served each mealtime! We did decide to go offsite numerous times for different excursions, however we both agreed that we could have easily spent the full week in the grounds of this stunning hotel! We arrived for our second visit to celebrate our 30th wedding anniversary . We had an amazing stay thanks to sn upgrade to a suite after paying a little extra. Well worth it as our balcony on the 3rd floor looking out at the sea and the sunset was worth every penny. The foid was great as usual thanks to the dinning room staff we were well looked after. My wife uses z scooter to get around and everywhere is accessible for us. The evening entertainment was ok but could be better. The drinks were very good and the bar staff work very hard getting everyone drinks. Look forward to our next visit thanks . The only downside was rhe weather. It was terrible we had 5 days out of 7 with thunderstorms and rain! If you want a relaxed environment, friendly attentive staff, a wide variety of tasty foods from around the world and comfortable room with beautiful views then this is definitely the place to stay although we upgraded to enjoy the privacy of the swim up rooms, the balcony room was lovely too. We had a great break and will return especially for the karaoke. We enjoyed our stay at the King Evelthon Hotel, however, there were a few minor points to be aware of; This hotel does not have a beach, just rocks at the edge of the sea. As with many hotels in high season, it was a nightmare to get available sunbeds around the pools. The location of this hotel is quite a way outside of Pathos town and is a bus or taxi ride away from anything, so not a lot to do in the immediate area at all. The A la carte restaurants are lovely, but book up very quickly, so make sure you book these on arrival. The rooms and public spaces are spotless and the staff were great. Our room wasn’t ready when we arrived so the first night we stayed in a different room. Water park isn’t included in the price (depends on who you book through whether included or not) daily charge applies. Because of the room mix up they included the water park. Surprisingly the water park was quite good no ques for the 3 slides there. Pool bar food was rubbish no selection and staff were rude/ unfriendly. Paphos itself is lovely and the zoo is definitely worth a visit. Buffet dinner and breakfast was basic. If your planning to stay here book the Mexican (located on the top floor) restaurant and Greek restaurant (located at the pool bar) sadly we didn’t try the Italian as this was fully booked. Upstairs bar views are amazing and a really nice atmosphere. Swimming pool was great and the kids club was varied entertainment which my daughter enjoyed. It’s a shame they messed outer room up on the first night and we weren’t the only ones there were other people staying there that it happened to as well. great hotel really helpful staff, great choice food, wonderful pool outside infinity and indoor.